Jenny and the team couldn’t be more helpful or friendly. A pleasure to deal with. Facility is clean and well organised. Both Jenny and Nigel were fantastic in a highly stressful time for our family moving interstate and organizing our home. They responded quickly to our needs with additional storage options. Always helpful and courteous. A credit to your company. Jenny the manager is extremely helpful. Customer service is second to none. Hard to find these days. Bulleen storage king have been storing my mothers furniture between homes. It can be a very stressful period but the kind people working at Storage King made it a breeze. I can recommend them as a very friendly and reliable company. They are so helpful, courteous and offer outstanding advice and recommended a fantastic removalist company when it came to moving my mothers furniture into her new apartment. My mum felt her furniture and boxes of stuff were very secure and she could visit her stuff as often as she wanted. We bought bubble wrap, butcher paper and storage boxes directly from Storage King. Thank you Storage King at Bulleen for looking after my mum so well. It gave all our family peace of mind. I asked for a quote 3 weeks ago, received a quote and was followed up by someone who works there. I said t was way to pricey. 3 weeks later and I've been called way too many times, get it together, stop being so pushy. Ridiculous. Get the hint. 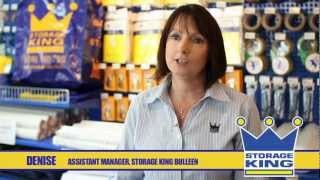 Welcome to Storage King Bulleen! Moving Home? Need more Space? De-cluttering? We have the solution to all your storage needs. We understand how stressful it can be. Let the friendly team at Storage King Bulleen help you now! So give us a call, send us an email or drop into the office and let Storage King organise your ultimate Self Storage Solution today! Come in and check out our new extensive range of merchandise. Our range of packaging material will meet all your needs, so why not come on down and have a look. Place your goods and memories in our clean, secure, modern facility, with confidence and peace of mind. Call us TODAY on 9850 1100 for free, friendly advice and don’t forget to ask for the manager’s promotional special for the week. Storage King Bulleen proudly services Templestowe, Doncaster, Balwyn North, Heidelberg, Ivanhoe, Templestowe Lower and Eaglemont.